shrinking and swelling the wood undergoes due to changes in temperature and humidity. Since wood is exposed to both long-term (seasonal) and short-term (daily) changes in relative humidity and temperature, wood is nearly always undergoing at least slight changes in moisture content. As the moisture content increases and decreases, the wood cells swell and shrink causing dimensional changes in the wood. The constant shrinking and swelling of the wood stresses the paint film causing it to crack and fail. Therefore, woods that shrink and swell the least are the best for painted finishes. The density of the wood. As a general rule (with some exceptions), the swelling of wood is directly proportional to the density of the wood. Heavy dense woods such as hickory shrink and swell more than lighter woods like poplar or basswood. How the wood is sawn. 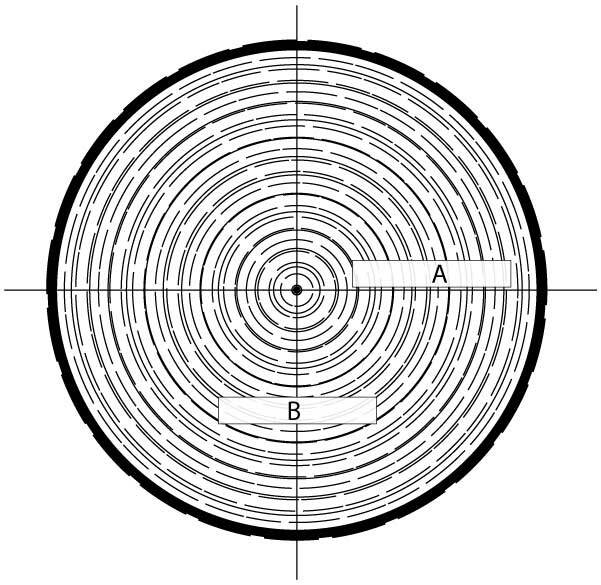 Wood shrinks the most in the direction of the annual growth rings as in plain-sawn or flat-grained lumber (“B” above). But it shrinks half that much across the rings as in quarter-sawn or vertical-grained lumber (“A” above). Unfortunately, many species are only available plain-sawn. Species with broad bands of latewood. Woods like southern pine have wide bands of latewood which are much more dense and expand more than the earlywood. Earlywood grows early in the season and latewood grows late in the season. Latewood bands are the dark colored growth rings. The type of finish. At best, any finish can only retard moisture changes in wood but cannot prevent it. Therefore, the choice of paint can play a role in short term changes. Other considerations for choosing a wood for paint can be: cost, decay resistence (for exterior applications) and hardness. Of the hardwoods, poplar is probably the best choice for an interior painted finish. It is harder than basswood and therefore does not dent as easily. Poplar is the least expensive of the hardwoods listed below and is available in wide widths. Unfortunately, it is commercially available only as plain-sawn. It has little or no resistence to decay and is not recommended for exterior use. Of the softwoods, cedar and redwood are both excellent choices, though they both have water-soluble extractives that can cause discoloration if not properly primed. They are highly decay resistant and are ideal for exterior applications. Since both are available in vertical-grain lumber, they offer greater dimensional stability. Cedar and redwood are far more expensive than poplar and therefore not as cost effective for interior work. Note that Radiata pine, the species commonly found in less expensive "stock" mouldings, has the worst qualities of all the softwoods shown. In the table above, note the correllation between the specific gravity (relates to density; the last column of numbers in each group) of a given wood to its other properties. Ability to hold paint is represented by numbers 1-5, 1 being the best and 5 being the worst. Resistance to cupping is ranked A-D, with A being the best and D being the worst.